When you think of severe weather, you probably think of the spring or summer. Severe weather, however, can occur at any time of the year. 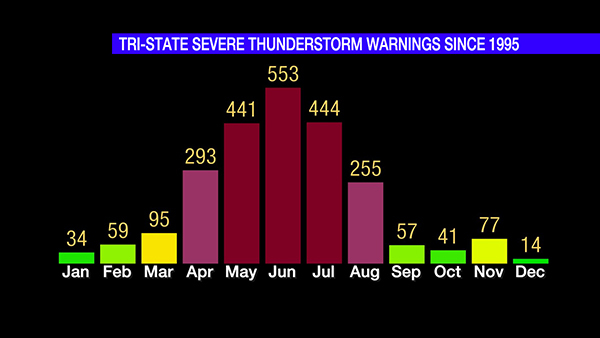 In fact, there is usually a secondary spike in the number of severe storms during the fall in the Tri-State. All modes of severe weather are possible during this secondary spike, as the graphics below suggest. Wind shear – or the change in the direction or speed of the wind with increasing altitude – is often stronger in the colder months; this is mainly due to the jet stream – specifically in the polar jet stream – being stronger. Instability, however, is often limited during the colder months of the year; this tends to limit the number of severe storms. The secondary spike in Tornado Warnings late in the fall is a byproduct of instability and low-level moisture increasing ahead of stronger fronts. On average, September, October, and November are the first, fourth, and seventh driest months of the year, respectively. August is – on average – the 6th driest month. These numbers imply that soil moisture is often drier during the fall compared to the spring, summer, and winter. This usually – but not always – means that flash flooding is less likely to occur. 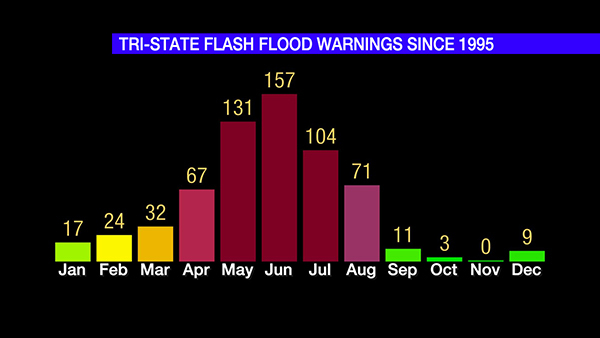 Locally, the combination of melting snow and rainfall are the main reason for Flash Flood Warnings in the late winter and early spring. 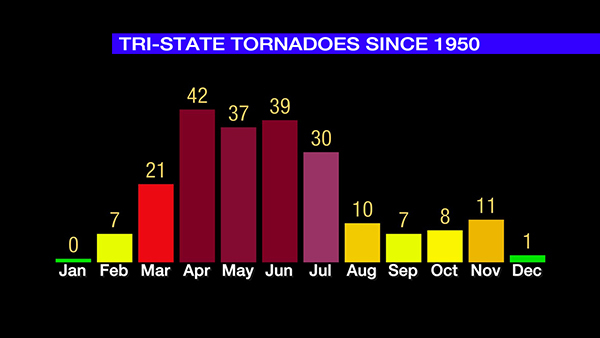 Many of these late-year tornadoes are short-lived, weaker tornadoes in squall lines, but significant tornadoes (F2+ or EF2+ rating) have been recorded in the Ohio Valley during October and November. An F3 tornado killed 25 in the Evansville, Indiana area before sunrise on November 6, 2005. There is a very minimal risk for damaging straight-line wind and a brief tornado. 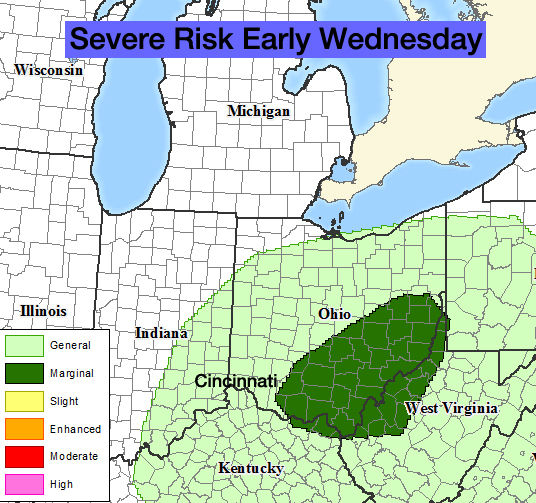 This threat is very conditional on instability being able to develop and ahead of the front Wednesday morning. 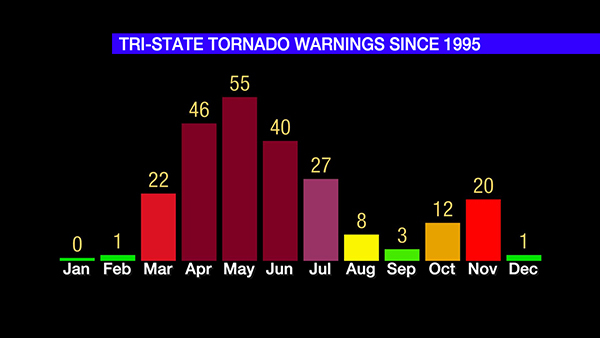 While the threat is small, the graphics on Tri-State warnings above should remind you that severe storms can and do occur long after summer’s end.